Mac OS X 10.7 features a revised Migration Assistant utility that is aimed at new Mac users coming from a Windows PC. The utility works by installing a client app on the Windows PC which allows the new Mac to transfer data and settings from that PC over a network. It’s not yet clear what exactly is transferred from the Windows PC to the new Mac, but presumably it would include traditional sources of Windows user files and data from My Documents, My Pictures, iTunes libraries, browser bookmarks, and more. 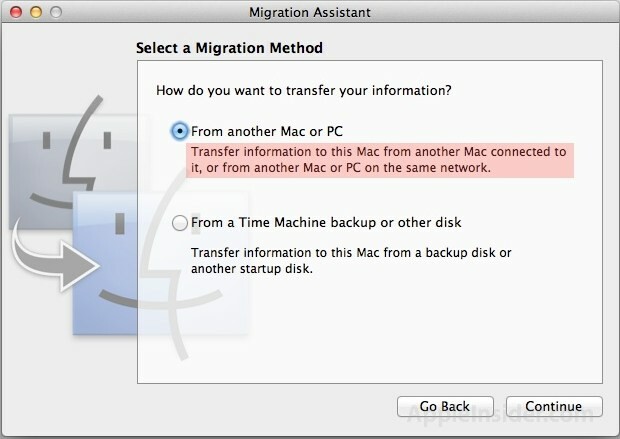 Lion’s new Migration Assistant was discovered and reported by AppleInsider, where the above screenshot is from. As with other new features of Mac OS X Lion, it’s important to remember that while these features appear in the Developer Preview, they may or may not be included in the final released version of the operating system. Those with Mac developer accounts can download and install Lion now, otherwise users must wait until this Summer for the public release. “AirPort” Now Called “Wi-Fi” in Lion, Simple Name Change or Sign of New Products? The iPhone and iPad are like gateway drugs, once someone uses one the next thing they want is a Mac. It’s rare to find a Mac user that doesn’t have an iPhone and that’s continuing to go both ways. Apple is smart, they’re making it as easy as possible to switch to their platforms. Anyone who says the Mac is dead is a fool, the Mac has only just begun. I seriously agree with you, aside from the performance debate between macs and. PCs, Apple does a fantastic job of, like you said, using products like the iPhone and iPad as gateway drugs into their more expensive products. PC companies are so splintered that there is little compatibility, or ease of use, between PCs and Windows products. ntm this new migration assistant for lion will help bring new peeps over.